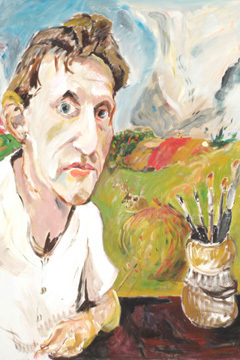 Critic Amaury Saint-Giles calls Allen Stamper's "Man with a Claw Hand" "a fresh and painterly idiom." The oil is among the works jurors selected for the Schaefer Portrait Challenge 2006 exhibit on Maui. A curious mix of portraits is gathered at the Maui Arts & Cultural Center for the second Schaefer Portrait Challenge, a competition that offers Hawaii's single most valuable art prize: $15,000 for one piece that best "communicates, both visually and conceptually, the subject's inner spirit or essence." The challenge was modeled on a successful Aussie competition. MACC's gallery director, D. Orwig, using that showcase as his guide, pulled together the first competition in January 2003. Faults of that show were many and glaring, and it seemed those quirks would swamp any future shows. The first four-person jury was inept at best and incompetent at worst, ignoring aspects of the published selection criteria they deemed not meaningful. Results jumped figuratively all over the canvas, with works good, bad and downright ugly. A quick walk through this year's show reveals (yet again) the collection's unevenness. I found quality work that showed not only exceptional technique, but also thoughtful interpretation and inventive presentation. But these special pieces were hung in tandem with works difficult to appreciate if your viewing experience ventures beyond portraits of the founding fathers on greenbacks. Changes hinged upon the choice of jurists for 2006. Included were four respected specialists in the arts: Jay Jensen, curator of the Contemporary Museum; Inger Tully, recently retired from Maui's Hui No'eau; Kapulani Landgraf, a respected photography/arts instructor; and Stephen Freedman, an internationally accomplished ceramist. They were joined by Millie Kim, a politically connected consultant in community relations. Wes Bogner's "Pekelo Day," an acrylic on canvas over panel, "is notable for technical finesse." The competition's multi-island jurying process continues to be a major problem, creating a lack of cohesiveness in the total collection. It would be better to give provisional acceptance to artists on each island until all the portraits have been viewed, rather than force the jury to accept or nix works without benefit of having seen each in the context of the whole gamut being judged. In what might be perceived as a move to control the prize, two jurists were added, both intimately connected with MACC: artist Wilma Nakamura and MACC board member Michael Moore. No doubt their influence was heavily felt, as the winning portrait is of the late Tadashi Sato by Kirk Kurokawa. 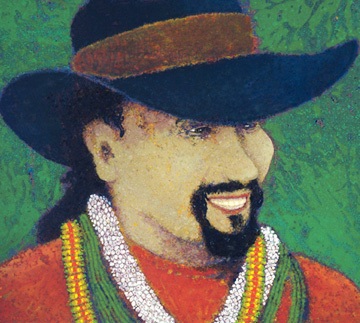 It is a beautiful portrayal of a much-respected Maui artist, but the local emotional connection to the subject far outweighs its quality. 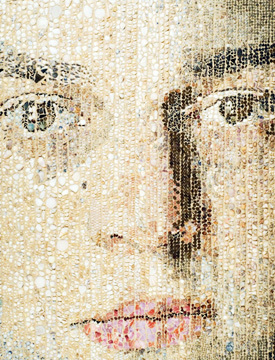 Randy Ross' "Self-Portrait" in pointillist manner with shells "is a visual tour-de-force," Saint-Giles says. It was as if the jurors could see no other work. Indeed, one jurist confided that he "just kept coming back to that image, despite the rest of the show's excellence." I'm certain a half-dozen equally deserving pieces never really had a fig of a chance. More's the pity that what is supposed to be an equal-opportunity statewide competition ends up promoting regionalism. Much remains to be improved about this competition, beginning with the selection process. Hawaii's most interesting artists should be enticed by a prospectus that enfranchises their quirkier natures while challenging any figurative concerns of those who would never try creating "likeness." Weight given by jurors to each artist's statement shouldn't overbalance the value of the physical art itself. Local emotional context also needs to be addressed and, of course, the question of self-portraiture. MACC should avoid seeking conservative painterly likenesses while plumbing the genre's reaches. The next challenge would be more challenging through a fine-tuning of both entry and jurying processes. On this page are portraits from the exhibit that speak volumes to me, with my comments. My choice for the prize would have to come from this small selection, but I do admit being very partial to another portrait, by my friend Shingo Honda, entitled "Amaury's Eye." There's something about his vision that reminds me so much of myself! 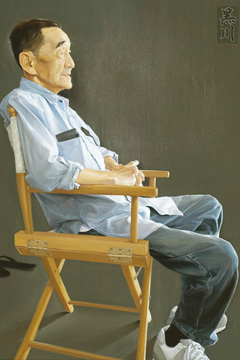 Kirk Kurokawa's portrait of late Maui artist Tadashi Sato won this year's Schaefer Portrait Challenge. Saint-Giles calls the work "a beautiful portrayal" but says selection of the piece promoted regionalism in the statewide contest.